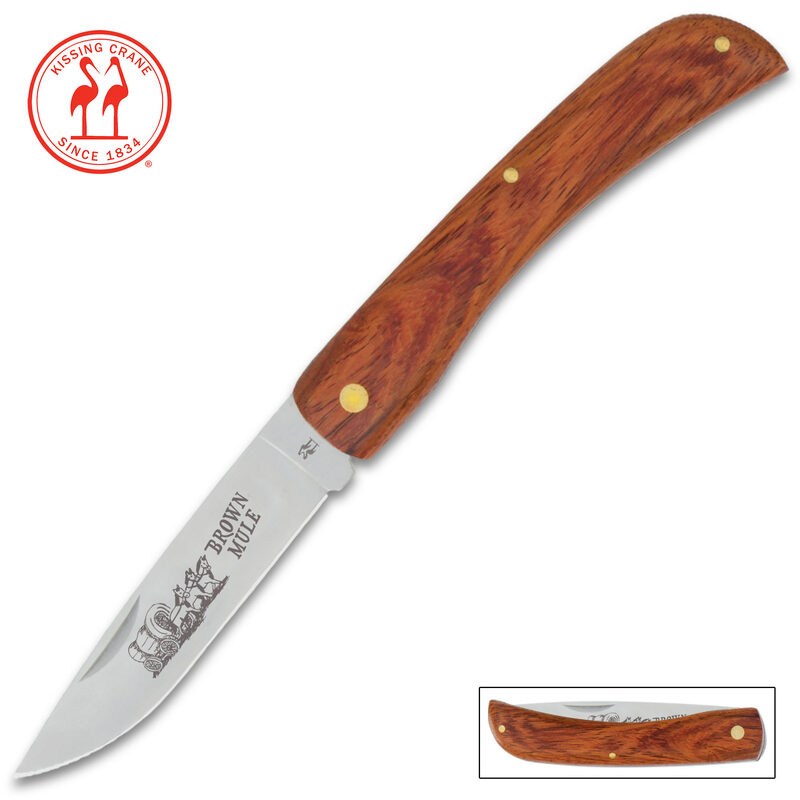 Kissing Crane Medium Brown Mule Pocket Knife | BUDK.com - Knives & Swords At The Lowest Prices! 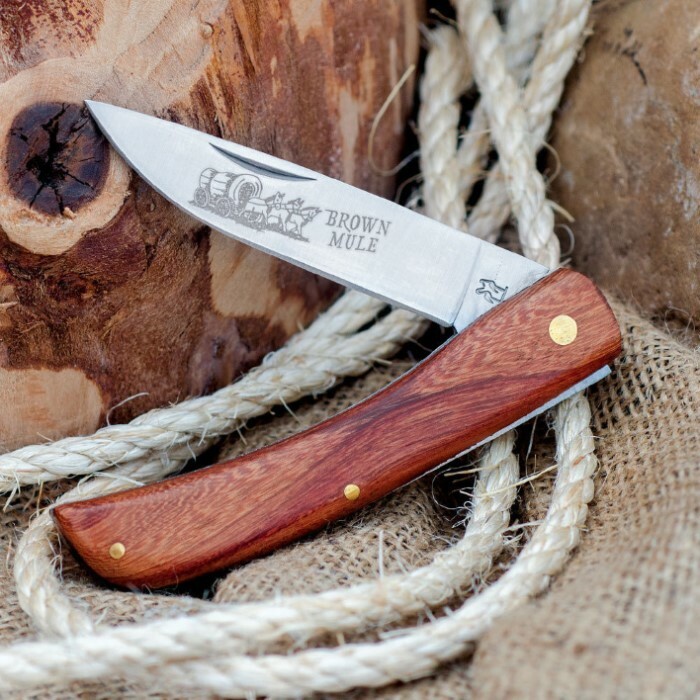 The Brown Mule Pocket Knife by Kissing Crane is a nod at the pioneer tradition of America so it has that family heirloom appearance. The 3 1/4" blade 440 stainless steel blade has a Brown Mule motif etched on the blade and the handle is a beautiful, solid hardwood. The pocket knife also has brass pins and liners that add to its beauty. Kissing Crane knives are a result of over 175 years of expert cutlery tradition. So, whether you are searching for authentic cutlery to collect, a top quality knife to give as a gift or a superior blade to carry, don't pass this one up! Just got mine and it’s great! Simple, sharp, just all around good shape. I recommend it! Blade has a very slight bend to it; also it is difficult to open the knife. There are also some very fine nicks on the top of the blade near the tip. I have always been very pleased with Kissing Crane, but not with this knife. I'll be returning it. Received my knife for Christmas, 2007. 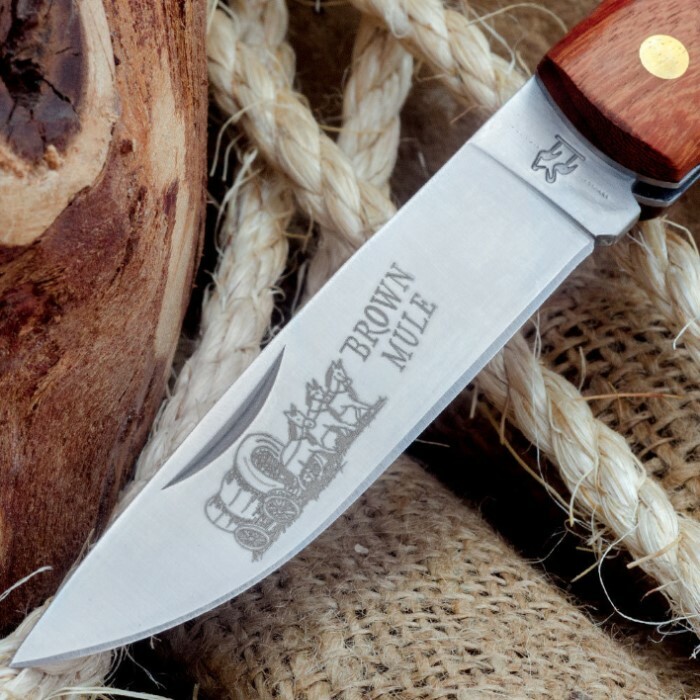 Understand that the blade print said "Farming Tradition" rather than "Brown Mule", but trust me when I say it is the same knife. Simply stated, I have put this knife through hell. I camp with it at least three times each summer and once in the winter, carried it with me when I was recalled to the Marine Corps, and used it as an EDC the rest of the time. It has cut branches, skinned small game, pared and sliced fruit, cut the strapping on MRE cases, used as a screwdriver, and opened letters at work. My blade is not stainless, so using a mag rod is no problem. The carbon steel has discolored somewhat, but is not pitted. I have shaved with the knife. The wood handles have no chips or rough spots, The original brass rivets are still holding the handles in place. The handles have turned a dark brown from dirt, sweat, rainwater, and blood from small game. They are smooth and slightly shiny from being carried in pocket. A few strokes on an Arkansas stone makes the blade razor sharp. A very decent knife, that is easy to carry in your pocket. Good quality. Nice handle with brass rivets. Old-fashioned classic. This knife is China made, but for the price, it's a good buy. I like that the knife blades are NOT stainless steel. It's hard to find a knife that has this type blade. I'm satisfied. I have used Kissing Crane knives for some time now and I find them to be durable and easy to maintain sharp. The Brown Mule is a great value. I found this Knife to be a great value. Holds an edge well and is now in my pocket everyday.